This is an excellent cake for someone like me who has, yet, pipe a cake skillfully. And you know what? The colourful M&M chocolates have covered the flaw of the cake that I have created when doing creaming. Ha ha! My nephew was so thrilled and totally blown away by this colourful cake. It has his favorite M&M chocolates and Kit Kat on it. He doesn’t know how to express his gratefulness to me. But from his happy face, it’s already made me feel so accomplished. As the cake is full of chocolates and candies, so I decided not to have chocolate cake. As usual, I used my favourite Plain Sponge Cake recipe. But this time, the cake didn’t turn up to be as good as the Pineapple Birthday cake, which I baked for my friend’s birthday. The cake is a bit hard and I think I must have over baked it. I should have shortened the baking time for 10” cake tin. 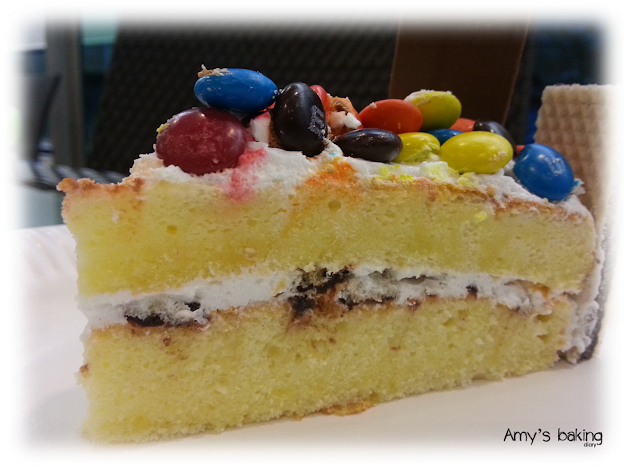 “Rainbow Delight” - It was named by Helen, my colleague because it’s a happy and colourful cake that makes people feel delightful. 1. Whipped the whipping cream till stiff. 2. Smash 2 packets (or to your desire) the Loaker waffle into small pieces. 3. Spread the whipped cream on the sponge cake. Top up with the smash waffles and spread another layer whipped cream on top of it. Place the other piece of sponge cake on top. 4. Cream the balanced whipped cream on the whole cake. 5. 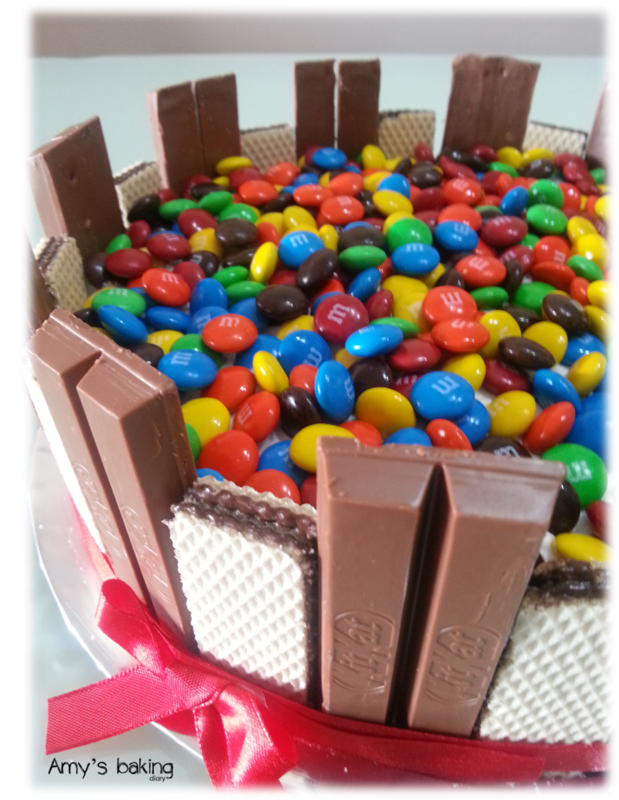 Stick the Kit Kat and Loaker Waffle alternately around the cake. You can choose to use all Kit Kat instead. 6. 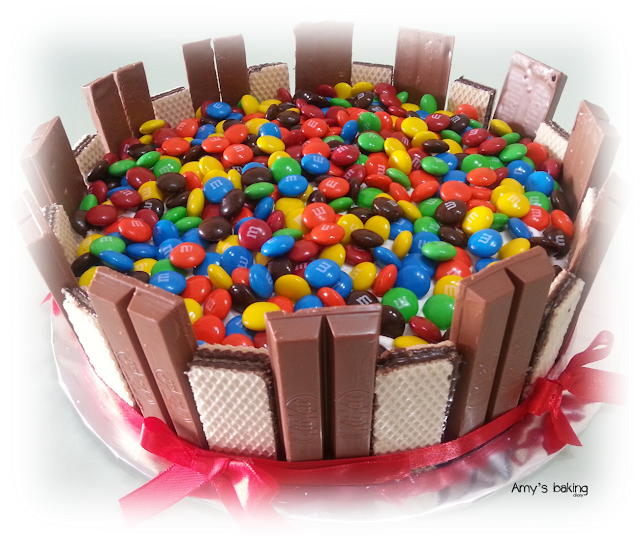 Sprinkle the amount of M&M chocolates to your desire on top of the cake. 7. You can tie around the cake with ribbon of your choice to enhance the decoration.